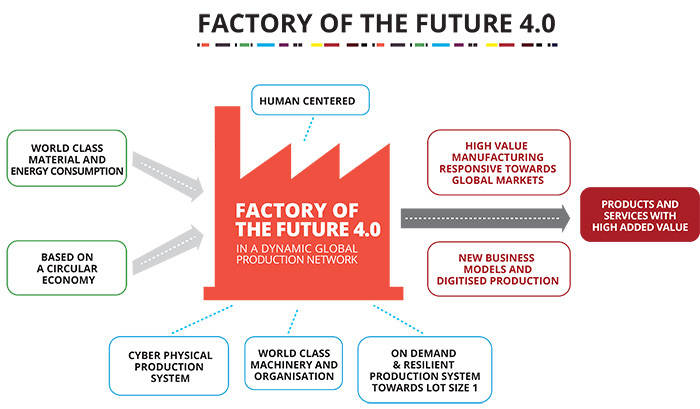 What is Factory of the Future 4.0? Factories of the Future 4.0 are forward-looking manufacturers who systematically take up the challenges of the fourth industrial revolution. They supply products with high value added and are flexible enough to respond to swiftly changing market demand. This also enables them to continue playing a major role in a dynamic worldwide manufacturing network. Being open-minded about new business models, Factories of the Future fully embrace digitised production processes. They take care how theycarefully handle energy and materials and maximally exploit the potential of modern production technologies. Besides technological innovation, social innovation is also high on the agenda, with special attention paid to staff involvement, creativity and autonomy in a human-oriented approach.